Naturally, we are proud of the work we do at Plantscapes. But ours is hardly an unbiased opinion. To help you judge the quality of our work, here is a sample of comments, testimonials, and reviews we have received from clients over the years. "The relationship that Issaquah Crown Condominium has with Plantscapes can best be described as a partnership rather than customer-vendor relationship. From the beginning, Plantscapes has worked with us to preserve, protect, and enhance our property through a proactive management of our landscaping needs. 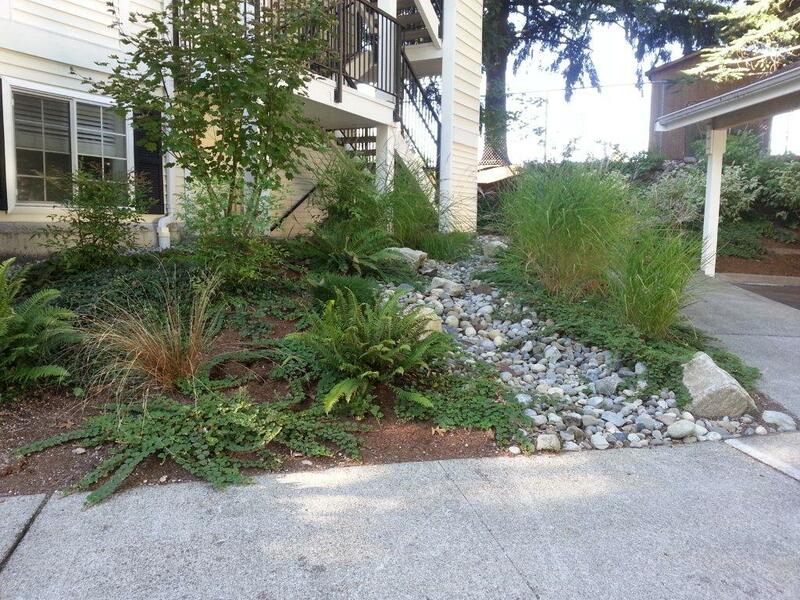 This was accomplished by incorporating a 'smart design' for Issaquah Crown's landscape refurbishment project with strong consideration to the total cost of ownership, including ongoing maintenance. Additionally, Plantscapes has worked with us to reduce irrigation water consumption via system oversight and upgrades, installed numerous hardscape areas onsite, and managed some problematic wet spots with improved drainage. Plantscapes visits our property to review services, offer recommendations for site improvements, and assist with landscape budgeting for the upcoming year. Residents and visitors alike regularly comment on how good the property looks. "Thanks Plantscapes!" "Plantscapes installed the landscape and irrigation systems for the Muckleshoot Indian Tribe Casino in Auburn. It was a difficult job working with a casino operating twenty four hours a day, casino security, a tight schedule, several construction areas with different schedules, saving and replanting existing 12-15 foot height palms, and then dealing with a client(s) that kept changing their minds. Even after some of the planting areas were completed, the client wanted of the large trees removed and changed to a different type. "Difficult indeed, but this firm was up to the task. The work was performed in an exceptional, competent and professional manner. The managers worked with me through out the entire project. I will recommend them for future work." "Gilberto did a great job with his team in decommissioning the planter box above the residential garage today. I took Gilberto up to the tenant space that overlooks the planter box so he could see what the tenant will see from now on. It was great. Please share my acknowledgement with Dustin and Gilberto. It is always nice to be recognized for a job well done. I wanted you to know how much I appreciate your coordination of this effort. It has been a long time coming and it is much appreciated your continued efforts on behalf of the North Pointe Association." "The plants were just delivered and they look marvelous! I am so very grateful that you were able to take care of us so rapidly. This small bit of greenery makes our office feel like a new business. We are small tech company so as you can imagine keeping our head above water is priority and plants were just not on the agenda. Thanks again - I'm so delighted and grateful." "Plantscapes, Inc. has performed the landscaping, irrigation and yard lighting tasks at the Montesano Condominiums Terrace Renovations project for Tatley-Grund, Inc. during the winter months, which alone was a significant task. "They demonstrated that they are concerned with providing an end product of quality and value and put out the extra effort in getting the project completed within time and on budget. "The field staff performed tasks without complaint and were both neat and courteous to the tenants "Tatley-Grund, Inc. and I, recommend Plantscapes as an honest and quality oriented company who will meet any landscaping, irrigation and lighting needs for your project." -- Dallas Lewis Sr. Project Manager Tatley-Grund, Inc.
"Plantscapes installed custom concrete pavers here at Salmon Bay Marine Center and the final result looks wonderful. The job was a complicated design to accommodate surface water flow and existing conditions, and it was completed in a timely fashion with high professionalism. The project management was particularly attentive and hands on, and we very much appreciated his dedication and skilled craftsmanship. We would most definitely work with Plantscapes and their crew again on another project, and highly recommend him as a valuable asset to any future projects." 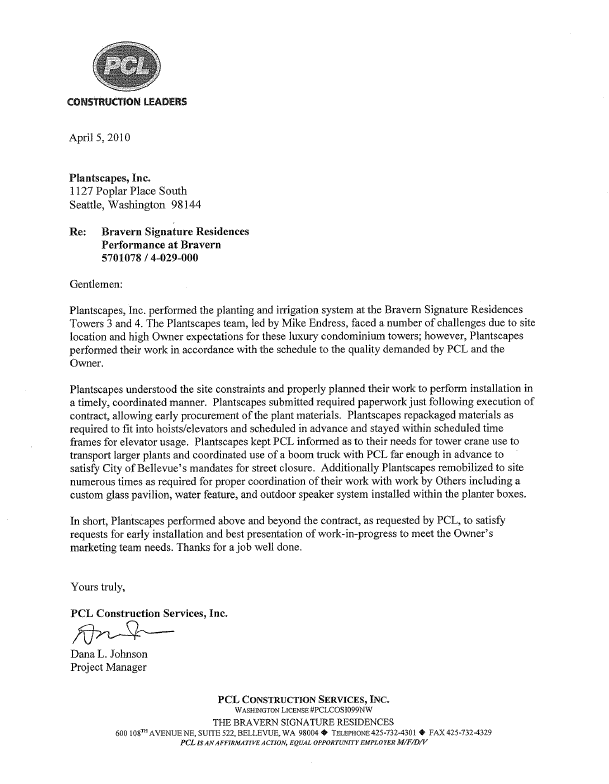 "The purpose of this letter is to let you know how pleased we are with the patio project your company just completed at our home in Beaux Arts. It’s everything we were hoping for. 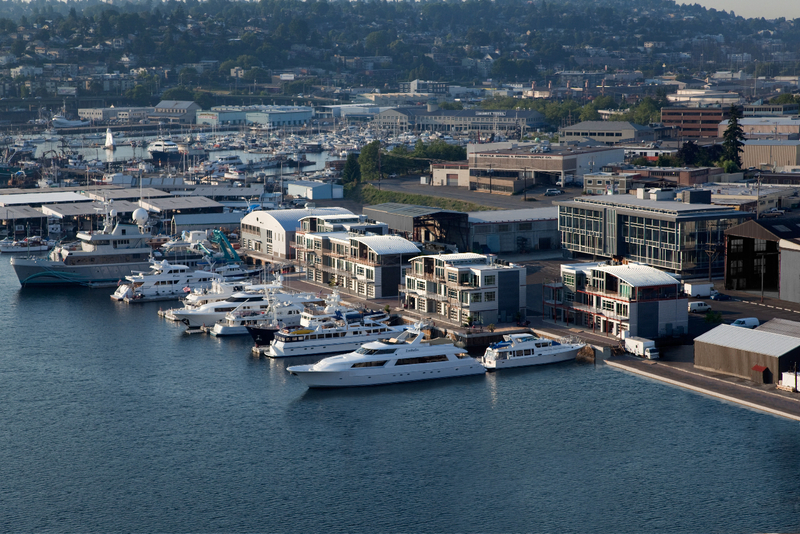 "Mike Endress did a great job laying out the design, getting the project off on the right foot, and then following up with frequent visits to the site to make sure things stayed on track and any unforeseen problems resolved. "Gilberto Rodriguez and his on-site crew were excellent. Access to the site was tricky. Your team had to back up a steep and curved driveway to limited parking space, and then haul all materials and tools through a carport. Even though there was no way to get large equipment to the work area, Gilberto’s team did a masterful job of breaking up and removing the old concrete patio, including rebar, and digging out soil so that a solid base of gravel could be installed. They did this with a minimum of noise and disruption. Likewise with the hauling, spreading, leveling, and compacting of the gravel/sand base, and then with the laying of the pavers. Gilberto is a perfectionist, as the end result demonstrates. Plus, he finished on-time and on-budget "These guys are true professionals: hard-working, efficient, meticulous, and committed to meeting the needs of their customer. I would be happy to recommend Plantscapes to anyone." I love the fountain and the great new look your team has given the hotel. With each new project that is accomplished, the place is getting such a great new look. Thanks for all your hard work and planning. I still think you are some sort of magician for getting all these projects completed in such a short time, on time and within a budget! Huge thank you to everyone on the team!